It's been a while since I've last blogged, but hopefully this post will explain why the delay! We've been very busy preparing for our trip to California for the Renegade Craft Fair in Los Angeles and San Francisco! California is so intriguing, with so much history, culture, great places to eat and the sunlight is really something else. As Canadians, we don't usually experience the kind of sunlight California offers. It's that warm light that gives everything a beautiful golden wash! After the show in LA. we made sure to stop by Pinches Tacos, Ham Ji Park...and when you're in the West Coast...In-N-Out burger is a must! We finally experienced something Elie and I have been wanting to experience since we were kids, Disneyland! We spent a full day at Disneyland for the 60th anniversary...and I have to say it was m a g i c a l.
Since we've been back, we've jumped right back into full production! We will be sharing exciting news very soon so make sure to stay tuned...and if you haven't already make sure to sign up on our mailing list to be the first to know! A LOOK BACK: ARTIFACT'S FIRST SHOW! As you already know we had our pre-launch at the One Of A Kind spring show, looking back it's all a blur! But we had an amazing eperience. It felt wonderful to finally show what we've been working on. Here are some photos of our booth. The day has finally arrived. 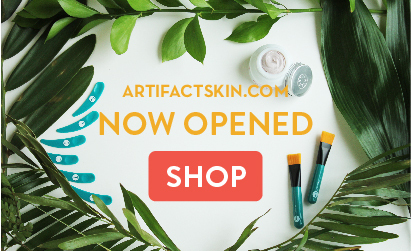 Artifact Shop is officially opened for business! I'm so excited to for you to try Artifact Masques. There are 6 different masques for 6 different skin treatments you'll want to try! People are always asking me which one is my favorite.. But, honestly it's really hard to choose. They're like my babies, I've watched each masque evolved into what it is now. I love them all because I molded each masque specifically for different types of skin conditions. Just like how our bodies are constantly changing so is our skin, we need to cater to different wheather conditions, hormonal, genetics and so on. Check out the shop to see which masque suits your skin! P.s. I'd love to know what you thought of them! 1 DAY LEFT UNTIL WE LAUNCH! Tomorrow we OFFICIALLY open our online shop! Days are rapidly passing me by and there never seems to be enough hours in a day! I don't think I've been this tired or stressed, but I've never been this happy. I believe in myself and what I am capable of. I've learned to stand my ground in times of transition and resistance from others and myself. I used to giggle when I heard people say the word 'energy' to describe a person's 'ora' (yes, even that word! ), but I am now a firm believer. I found that it's so important to surround yourself with 'positive energy'. I know we've all heard that before, but isn't it funny, when you experience it yourself the saying finally strikes a chord! This is just the beginning of a beautiful friendship with myself. You only get one today and there is always tomorrow to start fresh!